All My Bags Are Packed…Wait! It’s less than 24 hours before my flight. Classes are actually suspended in the Metro as well as in Bulacan (some parts) because of bad weather. God-willing tomorrow, I’ll be heading to Macau, then later on to Hong Kong, for my second out-of-the-country trip. The first was last year, to Vietnam and Cambodia, around the first days of October also. I should make this a tradition, perhaps? I think I’m all set. I still have to do some last-minute shopping of that ever-important shades tonight. I have to recheck my luggage because I’m really not all set. I have to repaint my nails, etc. But with the hours I still have left I think I can manage. I’m excited but not as excited during the past days and maybe not as excited as I will be tomorrow morning! I’m gonna be boarding a plane alone for the first time! I’m going to explore a foreign land alone for the first time also since I’m going to Macau alone for the first day. My trip companions and I will meet in Hong Kong at night where we’ll be checked in the same hotel at Tsim Sha Tsui. 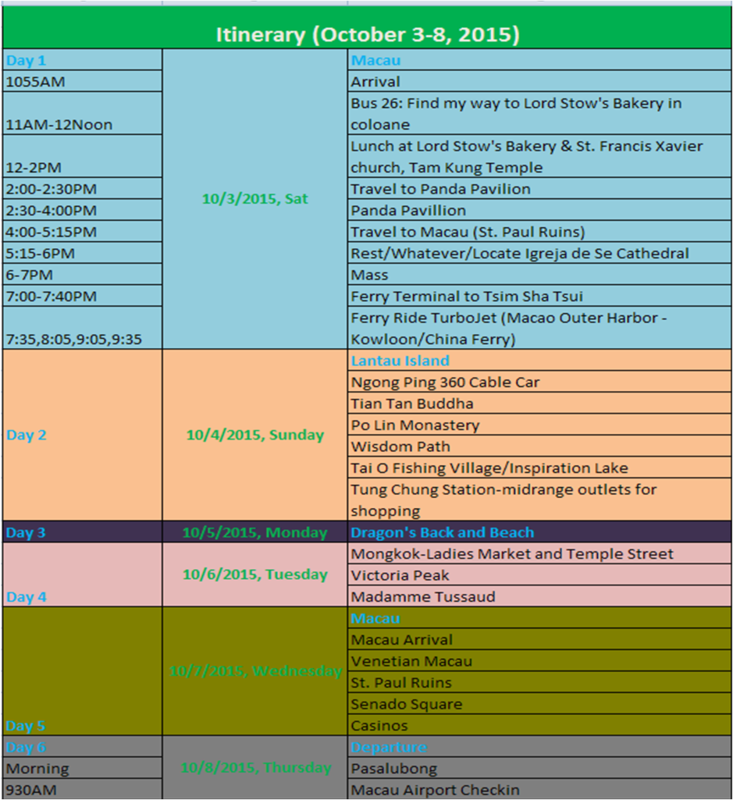 Below is my itinerary for this 6-day trip. EXPECTATIONS. I’ll post my expectation vs. reality after the trip. As can be seen, my first day in Macau is detailed. I’m traveling alone so I really made an effort to research. My boss, as he was here last month, assured me that Macau is very hospitable especially to Filipinos because there are lots of Filipinos living and working there. I’m counting in on that and armed myself with printed screenshots of google maps from my points of interest (just in case wi-fi isn’t accessible tomorrow). I also checked the ferry schedules, reviewed the whole map of Macau, followed up BPI everyday if they already have on-hand the Hong Kong Dollars I ordered and finally exchanged 1000HKD just today. I think I’ll survive the first day. Two things though to keep in mind – keep my expectations low and be patient. If you knew me, you’d know that patience is a virtue I’m still just trying to have. I’ve just been inflicted by cold (clogged nose) by the way. No worries, I can do this. Okay, Marlyn just messaged me to say that Cebu Pacific might cancel or delay flights tomorrow based on a Manila Bulletin online post. I called Air Asia just now and my flight is confirmed. My flight isn’t affected but of course my trip WILL be affected if Marlyn can’t go to Hong Kong as planned. Update: She buys another tickets via Air Asia to Macau, same flight as mine. First change of plans for this trip. It’s getting more exciting by the minute, baby! I just had a good customer service experience, Air Asia Call Centre! It’s easy to get through and I got the answer I needed directly and swiftly. Their Facebook page responses also. Rewind: I purchased the tickets from Mania to Macau (MNL-MFM) last February 26 for Patrick and I. Tickets just cost Php4,901, roundtrip for two. Sadly, Patrick cannot go with me this time. He’ll just accompany me to the airport. I think this is it for now. Got to go attend to my last-minute fixes and preparation and date tonight! So many thoughts running through my head this time. Those include the fact that I cannot serve as lector for this weekend and miss our monthly meeting for the third time since I joined the ministry. And yes, admittedly, I’m affected by the thought that I cannot watch Aldub tomorrow same time as half of the nation will (#teamreplay). I’m listening to Mandy Moore’s “Cry” right now. We offered intention for my safe travel this morning on the first Friday Mass at the office (along with some more intentions for a friend). Today also, as I said on Twitter, is not only a Friday – it’s the feast of Guardian Angels! So help me, God.